Beacon Press: Let the Students Speak! Author: David L. Hudson, Jr.
From a trusted scholar and powerful story teller, an accessible and lively history of free speech, for and about students. Let the Students Speak! 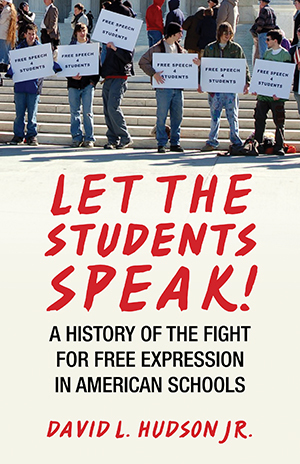 details the rich history and growth of the First Amendment in public schools, from the early nineteenth-century’s failed student free-expression claims to the development of protection for students by the U.S. Supreme Court. David Hudson brings this history vividly alive by drawing from interviews with key student litigants in famous cases, including John Tinker of Tinker v. Des Moines Independent School District and Joe Frederick of the “Bong Hits 4 Jesus” case, Morse v. Frederick. He goes on to discuss the raging free-speech controversies in public schools today, including dress codes and uniforms, cyberbullying, and the regulation of any violent-themed expression in a post-Columbine and Virginia Tech environment. This book should be required reading for students, teachers, and school administrators alike. After the 1988 Hazelwood decision, the U.S. Supreme Court did not take another pure student free expression case for nearly twenty years. This meant that a trio of First Amendment student speech cases governed American jurisprudence for almost two decades--Tinker, Fraser, and Hazelwood. Hazelwood applied to school-sponsored student speech. Thus, a student play, many student newspapers (that weren’t considered public forums), the school’s mascot, or the content of the school’s curriculum could be regulated by school officials if they had a legitimate educational, or pedagogical, reason. Fraser applied to student speech that was considered vulgar, lewd, or plainly offensive. There was disagreement among the lower courts on at least two aspects of Fraser. First, lawyers, school officials, and eventually judges disagreed as to whether Fraser applied to speech outside the school context or whether it applied only to vulgar and lewd student speech that occurred on school grounds--like Matthew Fraser’s speech to the school assembly. The other question was over the reach of the “plainly offensive prong” of Fraser. Some schools applied Fraser to any speech they didn’t like. In 1997, Nicholas Boroff, a student at Van Wert High School in Ohio, wore a T-shirt picturing the “shock rocker” Marilyn Manson to school. The T-shirt featured a picture of a three-headed Jesus with the words see no truth, hear no truth, speak no truth. The back of the shirt featured the word believe with the letters lie highlighted in red. School officials deemed Boroff’s shirt to be offensive and to promote values counterproductive to the educational environment; they suspended him. Boroff sued in federal court, asserting his First Amendment rights. Boroff’s attorney, Chris Starkey, contended that school officials could not punish his client for this T-shirt unless they could show that the shirt was somehow disruptive of school activities. He also argued that the shirt was no more offensive than other T-shirts that school officials allowed. Other students had worn “Slayer” and “MegaDeth” T-shirts without incident. The reason for the censorship, according to Boroff, was what the principal had said to him: the shirt offended people on religious grounds by mocking Jesus. Other courts also applied a broad reading of Fraser and determined that public schools could ban the Confederate flag because it was a “plainly offensive” symbol. Whatever one thinks of Marilyn Manson or the Confederate flag, if school officials can prohibit any student expression they classify as offensive or conveying offensive ideas, then much student speech is at risk. Tinker applied to most other student speech that was not school sponsored (Hazelwood) or vulgar or lewd (Fraser). There were differences and questions about Tinker too. In time, more school board attorneys interpreted Tinker narrowly as a case about viewpoint discrimination, in which school officials violated the First Amendment because they singled out a particular armband associated with a particular viewpoint. That is one reading of Tinker, but not the only reading. Others read Tinker more broadly as protecting a wide swath of student speech. Even though there may have been questions of application about all three decisions, the legal landscape in student speech cases remained relatively stable--at least at the Supreme Court level-- for many years. That changed dramatically with “Bong Hits 4 Jesus” and an interesting young man from Juneau, Alaska, named Joseph Frederick. In January 2002, an eighteen-year-old high school senior named Joseph Frederick conducted his ultimate “free speech experiment.” When he awoke that day, Frederick knew the Olympic Torch Relay for the upcoming Winter Games was scheduled to pass right across from his high school. Frederick later said that heavy snowfall that day prevented him from pulling his car out of the driveway and making it to school. Whatever the truth of that statement, Frederick had resolved to proceed with an experiment he had been planning. He had become interested in First Amendment issues during that school year, particularly after he decided to refuse to stand and salute the American flag or to recite the Pledge of Allegiance because he had learned about West Virginia State Board of Education v. Barnette (1943). For his act of recalcitrance, a teacher sent Frederick to the assistant principal’s office. That didn’t stop school officials from lecturing Frederick about the values of patriotism and love of country. Frederick countered that he loved his country, particularly the Bill of Rights. He believed students should possess First Amendment rights. And he wanted to push the limits. Frederick was determined to test a hypothetical he had developed concerning students’ freedom of speech. So, on that snowy January day in 2002, he waited as the Olympic Torch Relay passed near where he was standing on Glacier Avenue, a public street across from his high school, a spot he had mapped out in advance. Television cameras were there to broadcast the relay, the precursor to one of the most high profile of sporting events. Frederick, with help from fellow students, unveiled his “free speech experiment”--a fourteen-foot banner featuring a most unusual message spelled out in duct tape for the world to see: bong hits 4 jesus. Frederick said that he had seen the message on a snowboard sticker; a band from New Orleans had that stage name as well. “It was my idea alone to do something’ during the torch relay,” Frederick recalled. “It’s hard to say exactly how we made our decision of what to do exactly. My girlfriend and I decided to make a sign of some sort and there were quite a few suggestions from different friends before I finally decided on Bong Hits 4 Jesus.’ “ Whatever the origins of the phrase, Juneau-Douglas High School principal Deborah Morse was less than pleased. She marched across the street and ordered the students to drop the banner. Most quickly complied but Frederick refused. Morse grabbed the banner from Frederick, confiscated it, and ordered him to come to her office. His protestations that his actions were protected by the Bill of Rights and the Constitution fell on deaf ears.